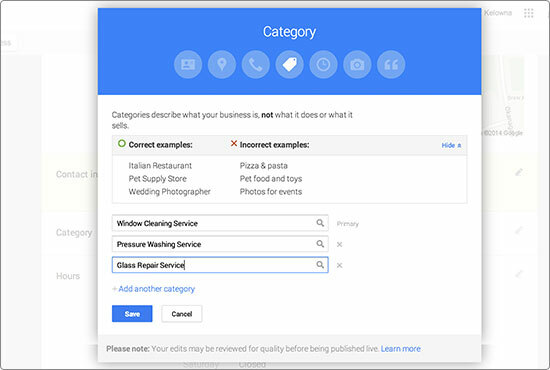 Have you Optimized your Google My Business Page? 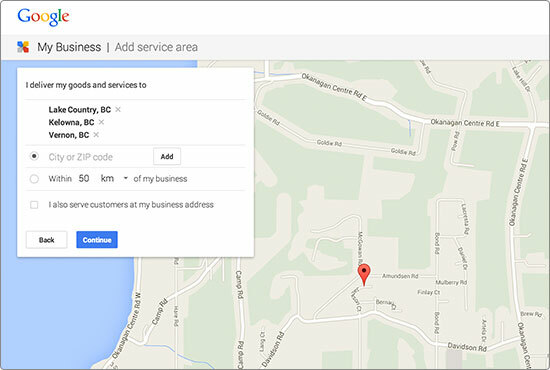 If you haven’t optimized your Google My Business page yet, we’ll help you get setup. If you’re interested in getting found by more local customers online, you better have the all new Google My Business page set up and optimized. 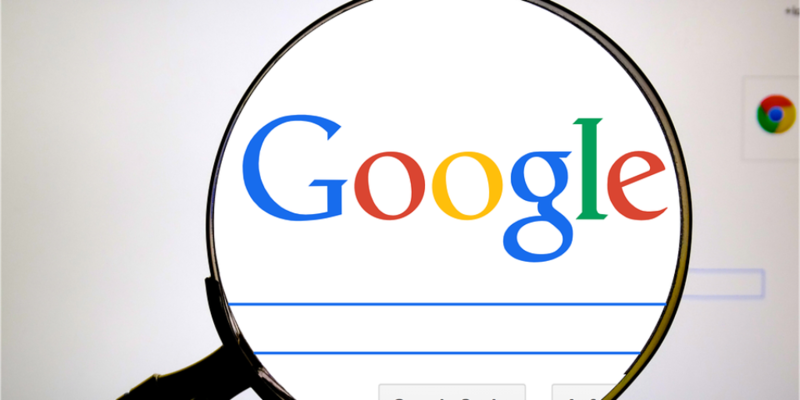 Google already uses these listing extensively in local search results, and down the road they’ll likely receive even more prominent positioning in search results. So if you haven’t created or optimized your Google My Business page yet, come for a short stroll with us and we’ll help you get all setup. 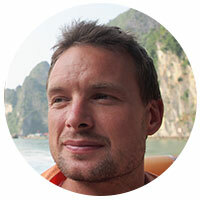 If you already have a Google Places page setup for you company this will automatically be converted to a My Business page, really nothing you have to do as far as set up goes, it’s already done for you. Other wise, jump over to www.google.com/business/ and click “Get on Google”. The first step is to add your company name and contact details. As simple as this step sounds, it’s perhaps one of the most important. Google and other search engines use something called ‘NAP’ (Name, Address, Phone) to compare your listing to other listings on the internet. 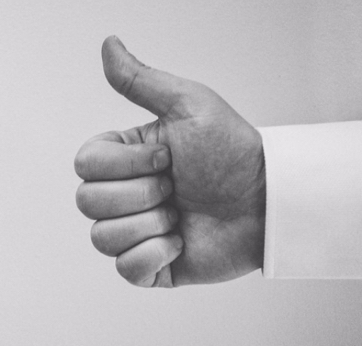 If your ‘NAP’ is an exact match with your other listings, trust in your business will increase. Important: Make 100% sure the company name, address, phone number, and email you enter are exactly the same as what you will use on your website. If these don’t match, it can reduce the ‘trust’ factor of your business listing. Next, you’ll be asked to add your service area. You can either do this by entering a list of cities/zip codes or you can enter an area radius. Give some thought to which option works best to describe the locations you service. Finally, if this is a new listing, you’ll have to verify your location. Google will send you a postcard with a secret code. 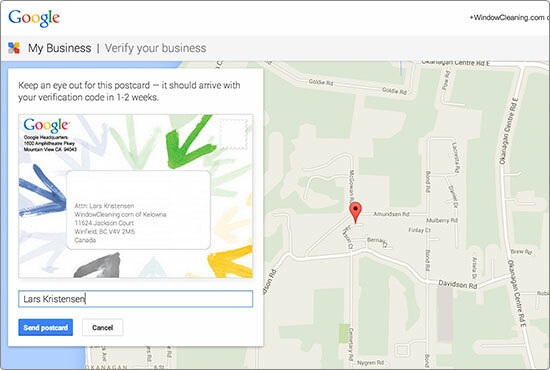 When you get the postcard, simply go to your Google My Business page, click verify, and enter the code. The code expires after 30 days, so it’s a good idea to do this as soon as you get your postcard. Keep your intro short, specific, and eye catching. Long intro’s often won’t be read as only a small portion of it will be seen without clicking to read more. Think of your intro as your company’s value proposition, one sentence that sums up what makes you special. “We’re the best window cleaners around.” – Unspecific & sounds like a used car salesman. Bad intro. “The most recommended window cleaning company in Phoenix” – Specific, includes location and service. Good intro. How well your Google My Business page fairs is effected by a myriad of factors relating to your website. The phone number and email you add here should match your website. This is a vital step. Note: If you take your online marketing seriously and track your website conversion rates using call tracking, make sure it’s implemented correctly. Add your real phone number to your website footer and clearly distinguish it as such using Schema markup. DNI (Dynamic Number Insertion) can also be used to show your real number to Google and a call tracking number to visitors. Be as specific as possible when adding business categories, but don’t spam it with an endless list of services. This is a description of what your business is, not what it does or what it sells. 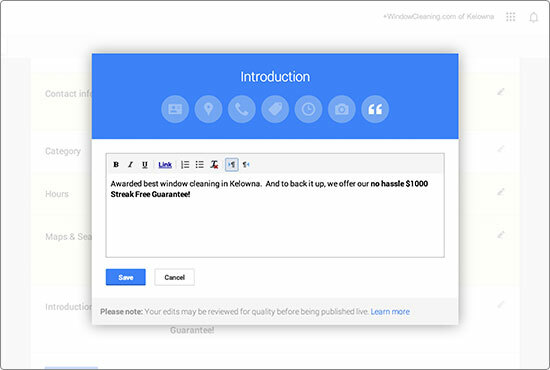 Your hours of operation will be displayed on your My Business page and can show up in search engine results, nothing else really to note about this. 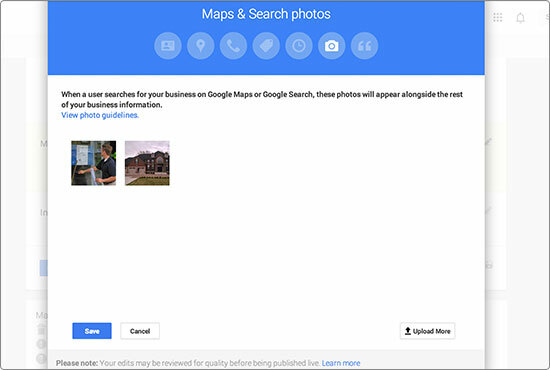 These photos will appear beside your Company name in Google search results and on Google Maps. Likely these photos will create the first impression a new customer is going to have about your company…so ya, they’re pretty important. Sloppy pictures will make your company look sloppy before you even set foot on the job site! Take the time to choose great photos that instill trust in the quality of your service and display your attention to detail. This is a small picture that can be placed in search results that represents your company. You can either use your company brand/logo for this or a great action shot. If you use a photo rather than your logo, try to make it personal, not just a random picture of a job site. For example, a picture that clearly shows you working is great. Ok, so you’re all done setting up and optimizing your page, that must mean it’s time to sit back and watch the customers roll in right? Hold on, it’s not quite that easy. However, creating and optimizing your page is a great first step and can help your business get found in local search results. Next up, add all your friends to your Google circles. The more connections you have, the greater your chances of having new potential customers see your Google My Business listing. And sharing fresh new content regularly on your Google Business listing is also essential to getting results! Photos of your company in action are a great thing to share, they show the quality of your work and make your Google listing look great. That’s it for now, if you have questions, add them to the comments below and we’d love to help you out.